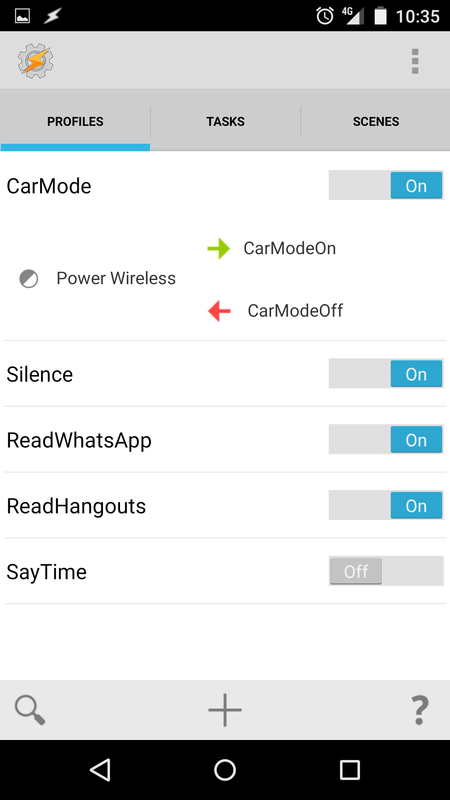 I wanted to be able to conveniently connect my Nexus 5 phone to my car’s audio system so that I can listen to music, podcasts and navigation commands. 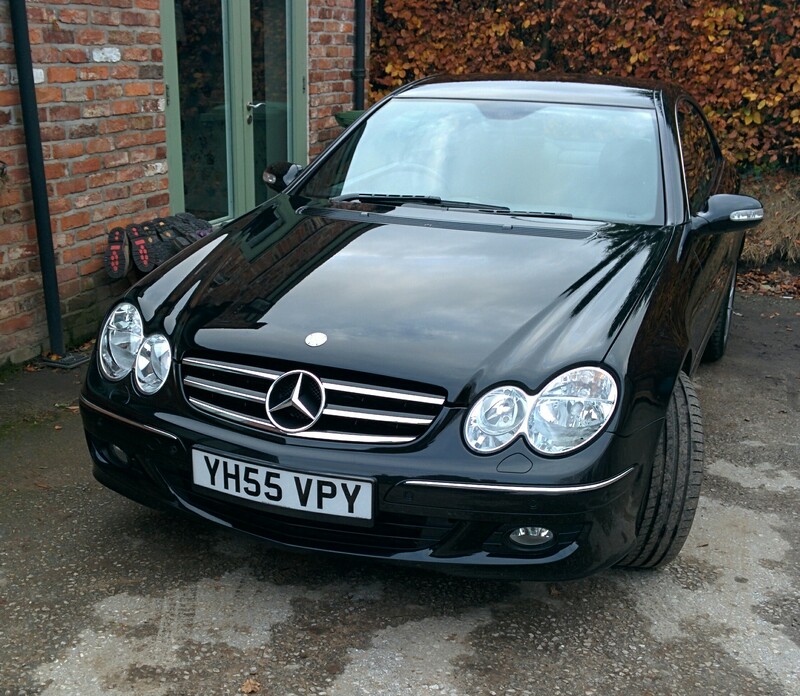 The car is a 2005 Mercedes CLK320CDI fitted with an auxiliary input in the glovebox. 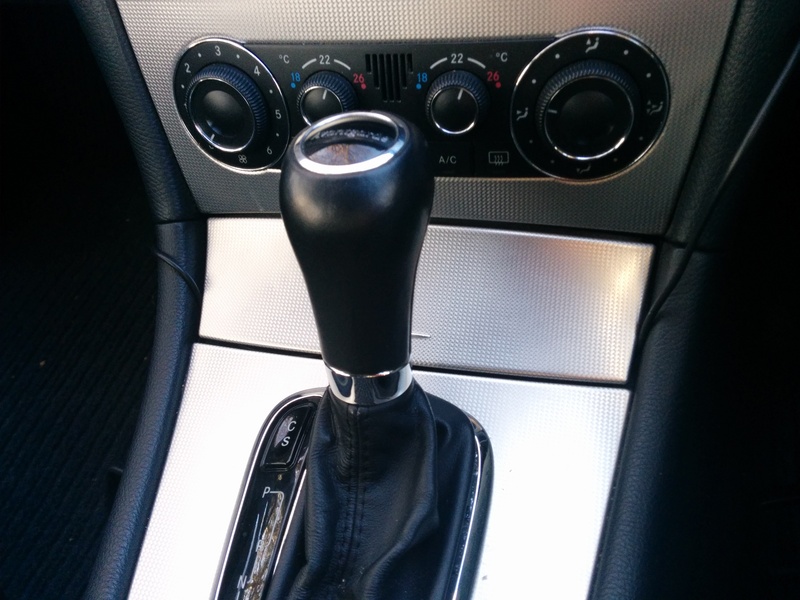 If your car has an auxiliary input then there is no reason why this shouldn’t work for you. I wanted something that was quick and convenient which, ideally, meant it could be done one-handed, with no need to plug or clamp the phone into anything. Ideally the solution should minimize any trailing wires or unsightly boxes stuck to the dashboard. It must also be possible to remove without trace. The solution I settled on comprises a wireless charger and mount, a Bluetooth A2DP receiver and USB power for both. Description: Google’s own QI charger not only wirelessly charges my Nexus 5 but also holds it securely, using sets of magnets in both phone and charger. 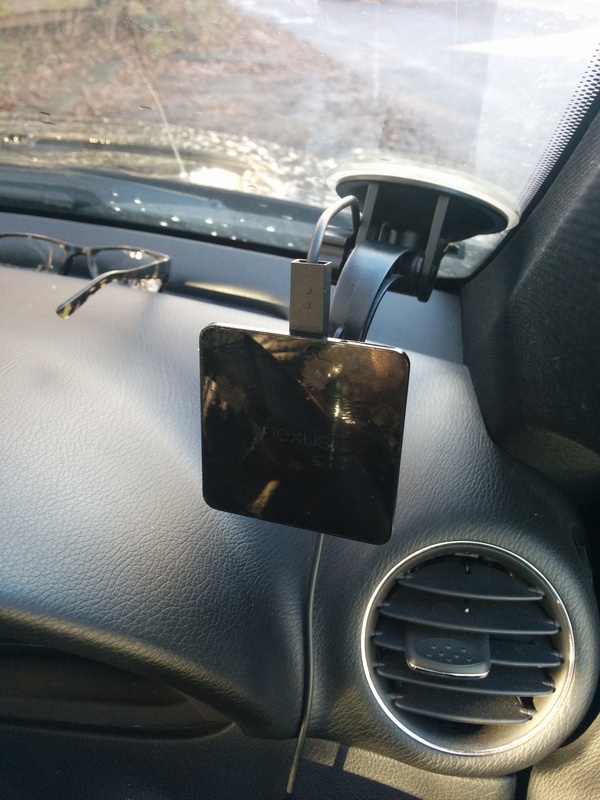 The QI charger is glued, with Araldite, to the stem of a windscreen mount that I already owned. The charger is mounted to the right hand side of the steering wheel. It is easily visible but doesn’t impair the forward view. It allows me to neatly route the power cable across from near the gear-shift, taking it under the steering column, to the charger. Description: There is a wide choice of Bluetooth receivers available. I chose the August MR220B because I have been very happy with my August EP650 Bluetooth headphones. They are well built, sound great and pair well with my Nexus 5. No reason to doubt that the MR220B would be any different. One slight caveat is that it was impossible to find out, looking at the specs, whether these receivers will turn on when I start the car. It does, but it won’t automatically connect. The problem being that when I leave the car it loses connection and then turns it off. When I return to the car it needs to be reset. A simple switch off/on sorts that out, but I am still investigating alternatives. 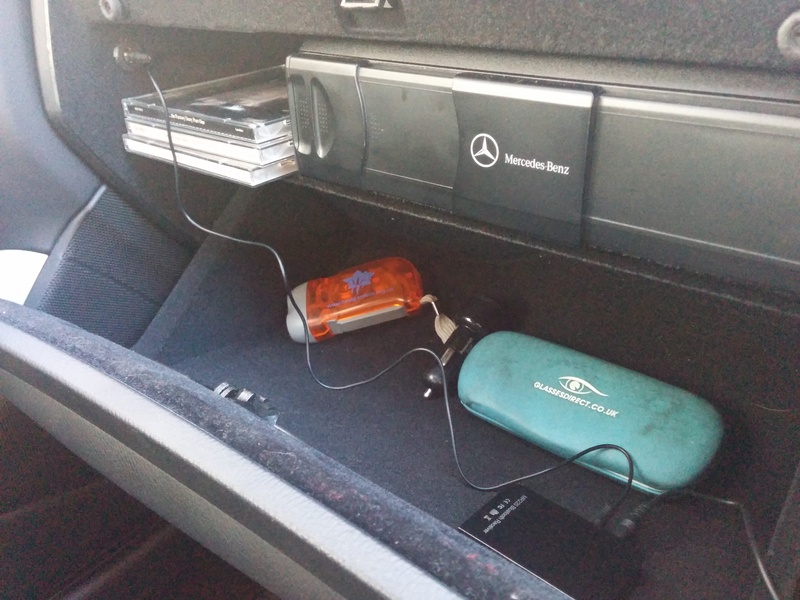 The Bluetooth receiver is mounted in the glovebox, powered by a cable running from just in front of the gearshift. Description: The QI Charger needs a higher current than a standard 1A adapter can supply. After some searching I selected the Scosche 12W+12W adapter. This is very compact and has two USB outlets that will each provide 2.4A. One advantage of this more compact adapter is that it (just) allows the ashtray cover to close, tucking away the cables fairly neatly. When all was installed I was getting some interference; a high-pitched whine. After some Googling and investigation I traced it to a problem with a ground loop. Adding a cheap ground loop isolator between the Bluetooth receiver and the aux input fixed that. The Android application Tasker is too broad to cover in a few paragraphs. 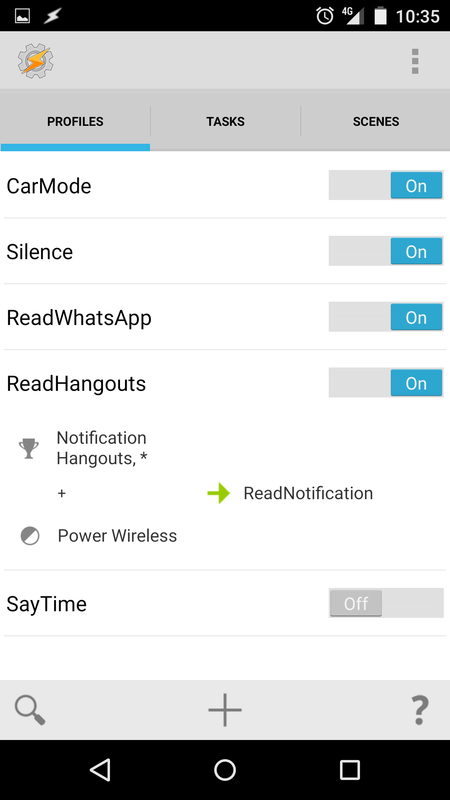 It allows you to configure your Android phone to react to events and changes in the phone’s state. 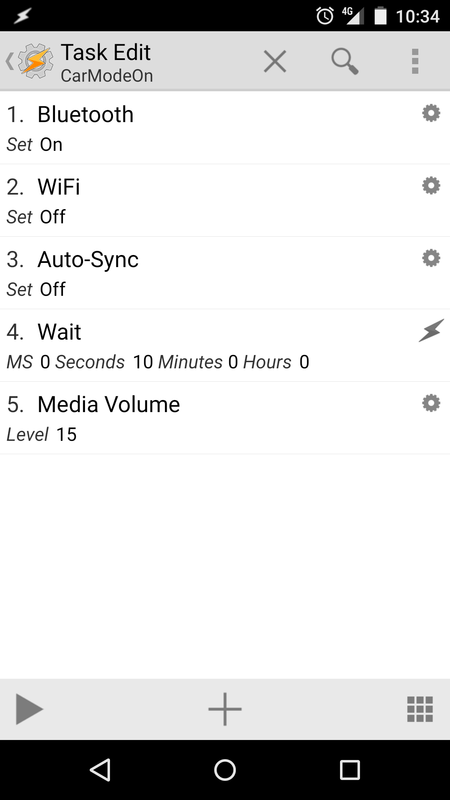 When charging wirelessly Tasker switches on Bluetooth, turns off WiFi, turns off auto-sync and sets the media volume to maximum. 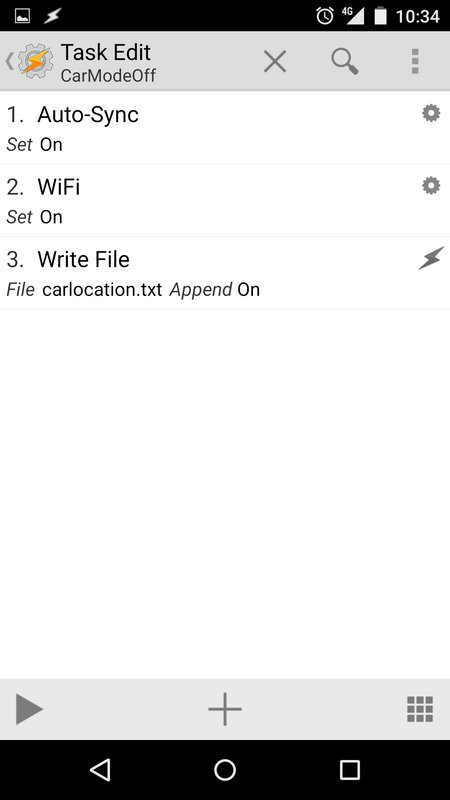 When it stops charging wirelessly Tasker turns Wifi and autosync back on and then writes my current location with a date/time stamp, to a text file. This allows me to keep a track of where I’ve been and where I’ve left my car. 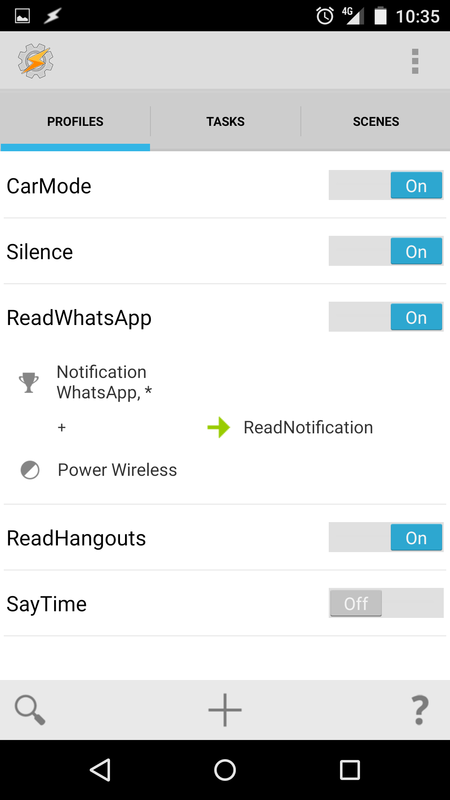 If an SMS or Whatsapp message arrives while the phone is charging wirelessly, Tasker reads the notification. Another post that is as much for my own note taking as anything else but, on the chance that somebody might find it useful, I decided WordPress would be better than Evernote. When setting up MythTV I have previously followed the excellent UK-centric guides provided by Garry Parker at http://parker1.co.uk/. When it came to setting up the channels for Freesat I found his guide at http://parker1.co.uk/mythtv_freesat.php no longer worked for me in one small respect – the channel scanning. I did some digging around for Freesat frequencies and here are what I found that work for me on the Wirral. Always sad to see good gear going out of the door but this one isn’t getting the use it deserves so it has gone up on eBay. It is an interesting beast, built to replicate the preamp of the Roland Space Echo to get that Brian Setzer tone when sitting between a Gretsch and a Fender Bassman. 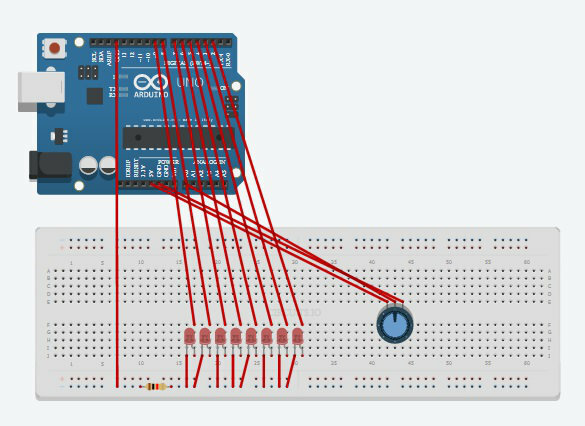 Earlier this week I noticed that Autodesk have launched a new online tool that allows you to prototype and test electronic circuits, including Arduino. Once you’re happy that you’ve got it working you can turn your design into a PCB and then order them online with worldwide free shipping. 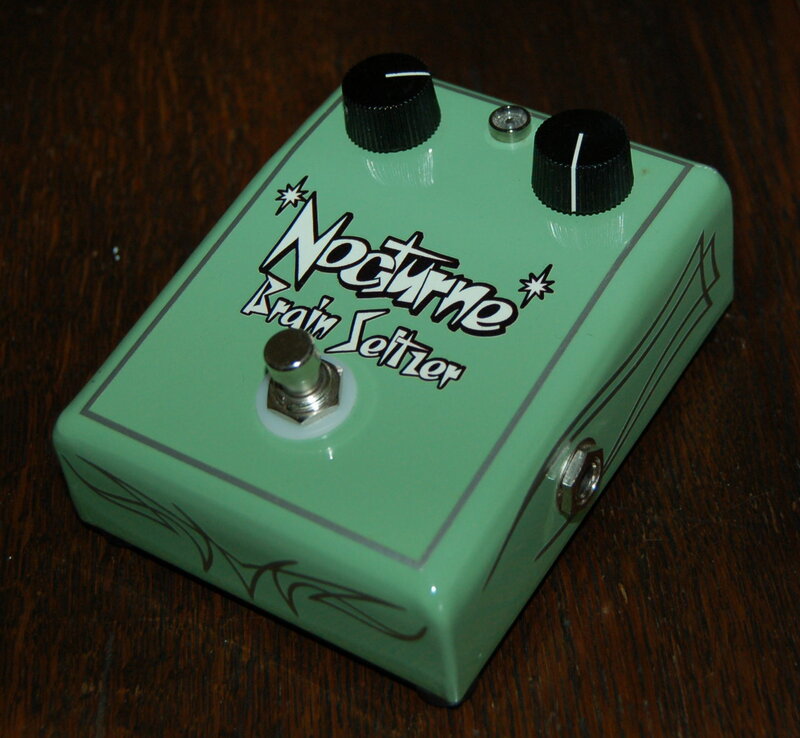 Strikes me as an immensely useful tool/resource for anybody interesting in pedal building and miscellaneous electronics projects. I’ve got an Arduino kit tucked away in a drawer and this has suddenly provided me with the opportunity to see how I can turn my tabletop bread-board experiments into something useful and useable. As part of the latest Six String Bliss album project we have the luxury of having home recording maestro, Jan Buchholz, undertake the mastering process. This means that, despite many people submitting songs, all radically different and using different DAWs, the end result will have an element of consistency. Jan stated his simple basic requirements: Stereo WAV file, 24 bit, 44.1kHz, with no heavy limiting/compression on the whole track. The last aspect of this is most important. Jan needs an amount of headroom to work with and if you’ve compressed the buggery out of your track he has nowhere else to go. To make the rest of the tracks consistent then he’d have to compress the bejaysus out of everything else and nobody wants that. To prepare my track for Jan I went through every track and made sure nothing was going beyond 0dB. If I had been smart I would have done this before I started mixing and during the mixing process. 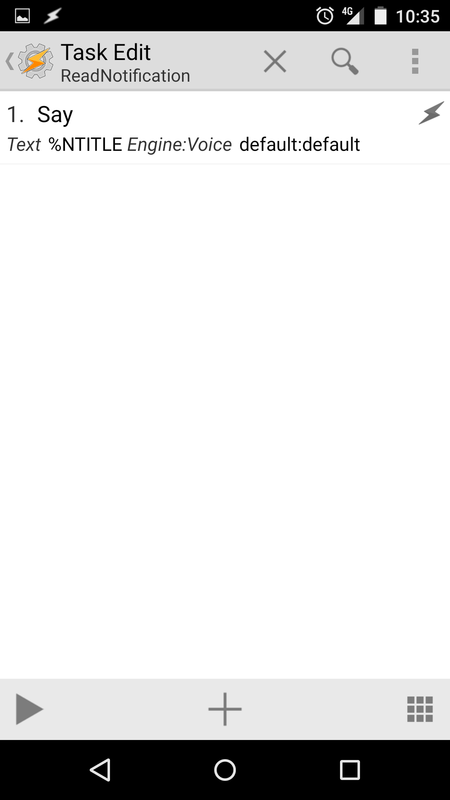 On every track I add the plugin called “JS: schwa/audio_statistics” at the end of the plugin list. Initially this is of no use because all the values are empty but, once you’ve allowed the project to play all the way through the values are populated. The key information we’re looking for is the “Peak dB”. Keep that under 0dB for every track and they’re all good to go. Note that every time you press “play” it resets the values and starts again. Finally I add the same plugin to the master track, run it through again and adjust the level so that the peak dB is somewhere between -6dB and -2dB. It goes without saying that this is without any other mastering type plugins on the master track. If you have the luxury of a mastering engineer then leave them to do their job. Your job is to focus on making sure each individual track sounds good and fits with everything else (volume, EQ and placement in the stereo space). I’m looking forward to hearing how the final track sounds once Jan has sprinkled his magic fairy dust on it. When the album has been released I will post before and after examples of my track. I created these for my own desktop. Should anybody else be interested please feel free to download and use (subject to licence terms below). All pictures taken with a Nikon D50 and post-processed to adjust the colour curve in The GIMP. The third has had a slight vignette added. 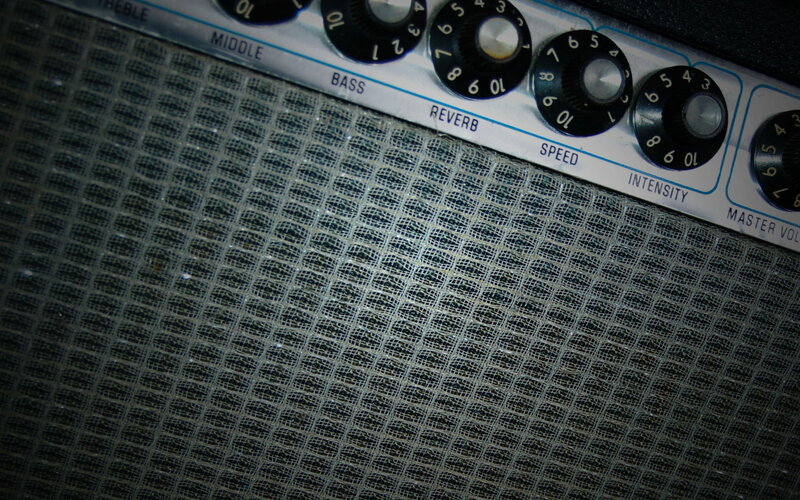 I have two main combos that I use; my self-built SE-5a in a 2×10″ combo and my Fender Twin with the standard 2×12″. 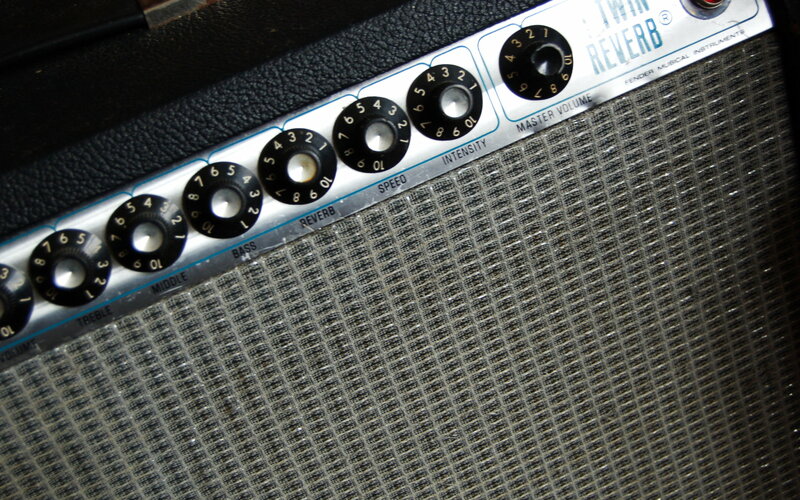 I’ve got in mind modifications to both so that I can feed the SE-5a through the Twin’s 2×12″ and vice versa. The problem with this is that of matching impedance. 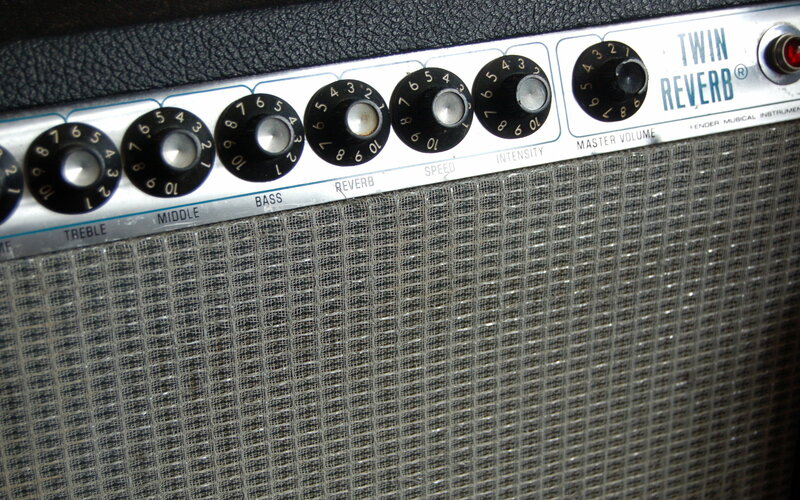 The Fender Twin requires an impedance of 4 ohms whereas the SE-5A requires either 8 or 16 ohms. All of the speakers in question are 8 ohm. For the SE-5a they’re wired in series for a combined impedance of 16 ohm and for the Twin they’re wired in parallel to give 4 ohms. I needed to be able to switch impedance. After a few minutes of googling I couldn’t find what I was after so I sat down, worked out how to do it and thought it may be worth sharing for others in the same predicament. 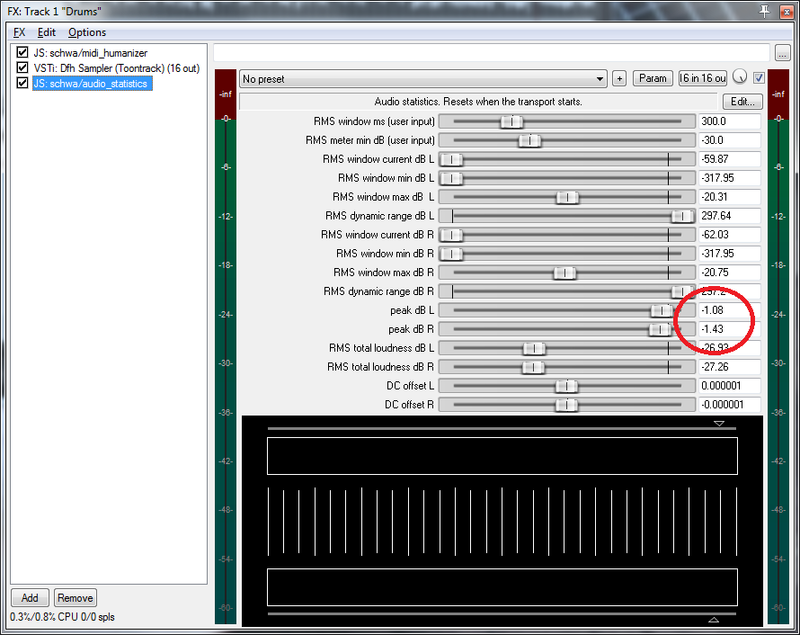 With a DPDT (double pole double throw) switch I can make a pair of speakers switchable between series and parallel. With 8 ohm speakers this results in each pair being switchable between 4 and 16 ohms. 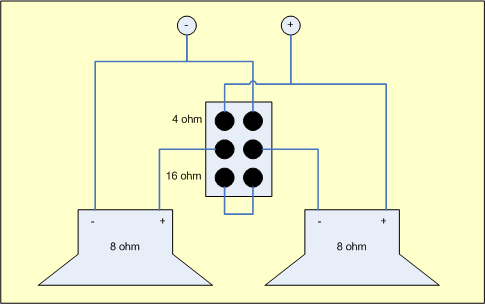 Here’s the schematic. Please note: I haven’t tested this yet. Once I’ve confirmed this is working I’ll report back but, for now, please treat this with scepticism. Should you be so inclined, you can find me on Twitter and Google+.